Posted by Teresa Mihelic HelpDesk on Monday, January 28th, 2013 at 11:07am. 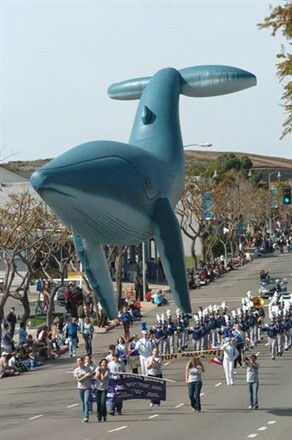 As part of the many festivities coming to Dana Point to celebrate the Annual Festival of Whales in its 42nd edition, the Whales Parades is set for this Saturday March 2nd 2013. The Parade begins promptly at 10 AM with a route along Pacific Coast Highway from Selva Road to Golden Lantern in Dana Point. FREE shuttle service to and from Harbor parking lots will be available beginning one hour (9 AM) from the parade start time. Arrive early, enjoy breakfast harbor side, board the free shuttle and then spend the day visiting all the great events located throughout the Harbor and La Plaza Park. So Cal Woodies 12 Noon – 4 PM: The best of the best will be on display from the official Southern California Chapter of the National Woodie Club. Immediately following the Festival parade So Cal Woodies will cruise down from the parade to the grassy areas along the Harbor walkway. Stroll along the Harbor walkway and enjoy this one-of-a-kind display! Parade entry applications are due no later than end of business day Friday, February 15, 2013.